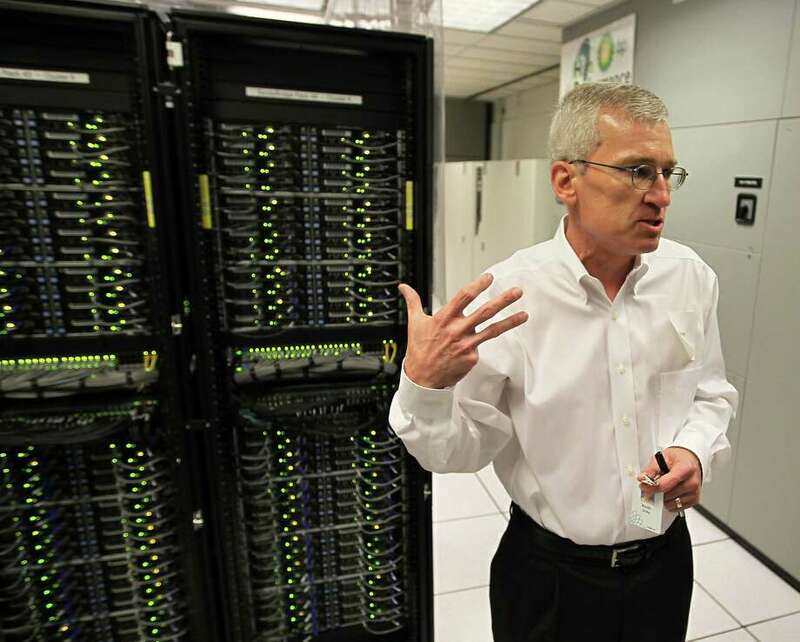 Keith Gray, Manager of High Performance Computing for BP, gives the press a tour of the current HPC (High Performance Computing Center) at BP’s North American headquarters Thursday, Dec. 6, 2012, in Houston. British oil major BP has more than doubled the power of the supercomputer that discovered 200 million barrels of oil in a hidden Gulf of Mexico cache last year. The machine is now the most powerful commercial research computer in the world, BP said. Last year, BP began testing a new algorithm to image under deep-sea salt domes, which distort seismic waves that companies use to map features below the earth, making oil harder to locate. Scientist Xukai Shen and his team produced a new, more detailed image of the earth layers under BP’s Atlantis field, in 7,000 feet of water 150 miles from New Orleans, eventually helping the company identify reserves worth an estimated $2 billion in recoverable oil. The computer’s new power doubles its speed and boosts storage to 30 petabytes — the equivalent of 500,000 iPhones — reducing the time needed to analyze “vast” amounts of seismic data. The computer, BP said, is now 18 times more powerful than the fastest supercomputer a decade ago. It has already identified an estimated 1 billion barrels of oil in BP’s four Gulf hubs.